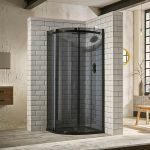 Quadrant shower enclosures are a tried and tested design and one of the most popular styles for a family bathroom.They're robust and can manage constant use. Quadrant refers to he shape of the glass unit, either a square or rectangular design with one corner rounded off. Quadrant and offset quadrant showers are corner fitted and use the tiled or panelled walls of your bathroom to complete the enclosure. Most have single or twin sliding doors perfect in smaller bathrooms where no outward opening is possible. Still there are models with hinged doors available if you prefer. Sizes for quadrants start at 800x800mm and go up to 1000x1000mm. 700 and 760mm models used to be popular but given their limited space most manufacturers no longer make them. Some of the 800mm models may though adjust down by 20-40mm, check the specifications of individual models if you're looking for a small cubicle. The smallest standard size offset quadrant shower is 900x760mm with the largest being 1200x900mm. Most offset models are reversible, meaning you can install in a RH or LH corner by simply flipping the unit. Only those with cut out glass, exposed rollers or single doors may require you to choose the correct handing for your installation space. SEUK offers luxury models from brands such as Ultra, .dilusso, Merlyn and Aquaglass. These might include features such as easy clean glass, exposed mechanics or specialist glass options. Meanwhile cheap quadrant shower enclosures are available from Premier, Shield and Aquatech and even these are starting to include high end features such as easy fit systems or thicker 8mm glass. Regardless of brand or price all quadrant showers that we stock come with at least 2 years manufacturers guarantee and many have a manufacturer backed lifetime guarantee for complete peace of mind.